Every day is a day like no other – here in Africa, where giants roam and top predators hunt – where life and death go hand in hand and where wonders, big and small, wait around every corner. Strengthening family bonds, catching lunch and assuring the survival of a new generation – it’s a round-the-clock job for Africa’s wildlife. From dawn till dusk: every day is a new adventure. Throughout the whole night, a male ostrich has been guarding his most-prized treasure: a nest full of eggs – the next generation. He shares the job of egg incubator and sentinel with the female. But this morning, at the end of his shift, his vigilance pays off. Each chick has managed to hack its way out of the thick-walled eggs. Meanwhile, the meerkats are only just waking up. No point in leaving a warm burrow while the early morning coolness still lingers! But as soon as the ground is warm enough the meerkats emerge, ready for a busy day. Everyone will lend a paw to find food and guard the lively youngsters! Freezing cold mornings and even snow – in Africa? Welcome to Mount Kenya! At over 5,199 metres, it’s the second highest mountain in Africa. To survive in this spectacular environment you need a thick skin – and the fur of the cheeky little rock dassies is thick enough to endure the coldest winter. Still, they like to soak up the early morning sun, garner enough energy to face the day ahead. A very different climate prevails in the Namib Desert. Around noon the temperature reaches a searing 50 degrees Celsius. While most creatures take shelter from the blistering heat, the baboons go about their business undeterred. Even when finally pressed to find drinking water, they do so with calm, and a certain nonchalance. They let the desert’s mightiest inhabitants, elephants, sniff out water from under the sand. 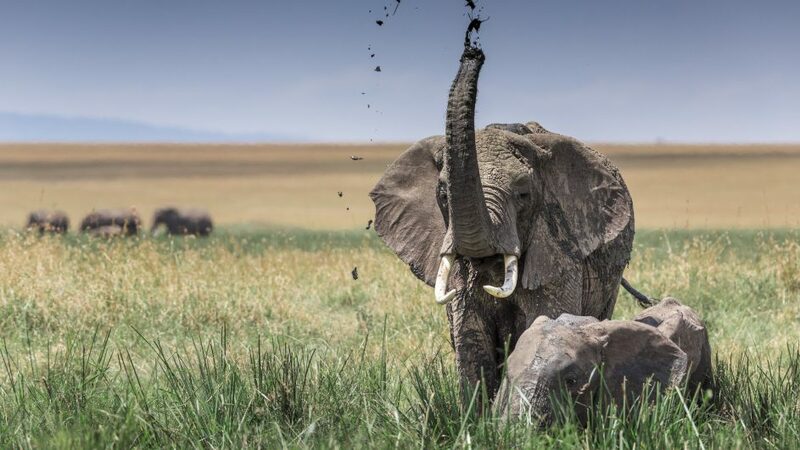 The elephants do the hard and dirty job of digging a well – they’ll drink first, then the baboons. A long, exhausting day in Africa draws to a close. Under a dome of twinkling stars, the day shift tries to rest, leaving the ‘night owls’ to roam the continent. Tomorrow will bring life, death, failure and success again – but what a difference a single day can make.